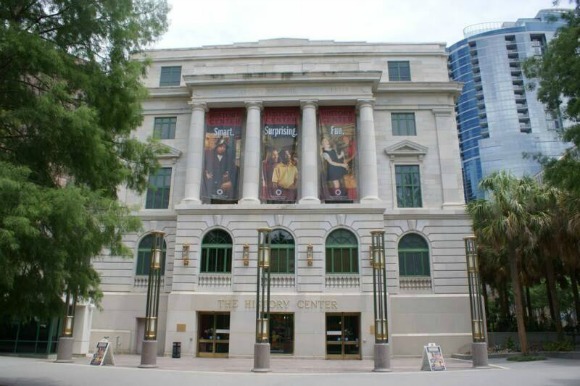 This article about the Orange County Regional History Center is by Greg May of Orlando, Florida. Every great city has a museum, and Orlando is no exception. When Orange County completed their towering courthouse complex in recent years, the Orange County Regional History Center found a new home in the original courthouse building that was constructed in 1927. This building is in the heart of downtown Orlando. Learning about Florida's history is fun at this museum. Upon entering the spacious lobby, you find yourself gazing upward as Florida wildlife, artifacts and other memorabilia representing 12,000 years of Florida history are suspended from the ceiling like an Alexander Calder mobile. The four levels of the History Center showcase Florida's history with First Peoples, European First Contact, Florida Seminoles and Florida in the Civil War. Florida's Pioneer heritage, with exhibits of cattle raising and citrus growing is in marked contrast to Destination Florida: Tourism Before Disney. Visitors can enjoy a self-guided Audio Tour of the Museum free of charge with admission at the Guest Services desk. It is a pleasant and economical alternative to the many better known Orlando Florida tourist attractions.